I was trying to automate the hybrid app build using ionic2/Angular2 and typescript. I am not able to identify elements after swtiching Context to WEBVIEW. Am I setting the capabilities in correct way? Problem is I am not able to identify elements in WEBVIEW even after switching the context. 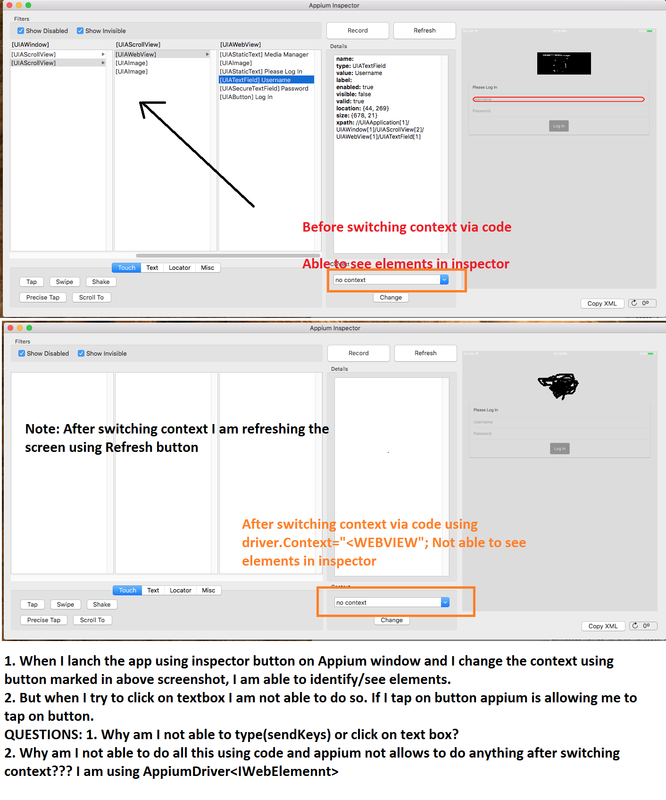 and refresh the appium inspector I am not able to see/identify single element.Everything goes away. Error is thrown as: "An element could not be located using given search parameter"
Launch the safari browser in mac PC in menu you should have Develop options. Click on the Develop option in that list it should list the your device. Select your device -> web page. (it show’s only if web page is open in phone). you will able to locate the web elements. 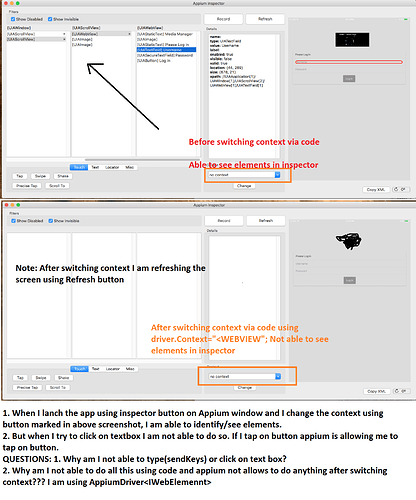 Look for how to switch the webview and you need to run the ios_webkit_debug_proxy. I did all these above steps but no help. I am getting strange behaviour, If I am not using autowebview and then lauching the app then I am able to see index.html page. I suppose Appium is considering and taking my app as native app. Even checked through localhost:27753 and the same behaviour. info: Pushing command to appium work queue: "au.alertIsPresent()"
browser Name Safari but you gave IOS and it should be platformversion not the plaftormName. problem may be with capabilities. Try to print the webview before switching after switching. Am I using correct capabilities?? can you copy paste all the capabilities? may be your making mistake in that. I was finding the solution and came across some articles where protractor + APpium is used for automation of ionic app. Mine is also same. Can’t we automate ionic app only using Appium. 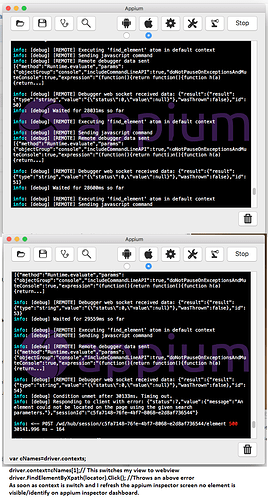 Is it possible that Appium is not able to identify Ionic html tags?? Hope you are using the hybrid app ? try adding this cap. What is the advantage of having private obj ? Yes I am using hybrid ionic iOS app. Defined them private since I don’t want to use them outside the class. Does appPackage is required for ios automation? yes its compulsory, Read the document carefully provided by Appium. I read and found appPackage is required only for Android on link. If you have any other reference, please do share. iOs how to resolve this issue. element is overlapp in frame so finding element is difficult .plz tell me how to find element. I face the same problem … I’m using ruby. I have a popup that can not click at all. Application developed in IONIC (latest version). I am also facing the same issue. Unable to switch to Webview from Native app in IOS. Scroll in IOS also not working. 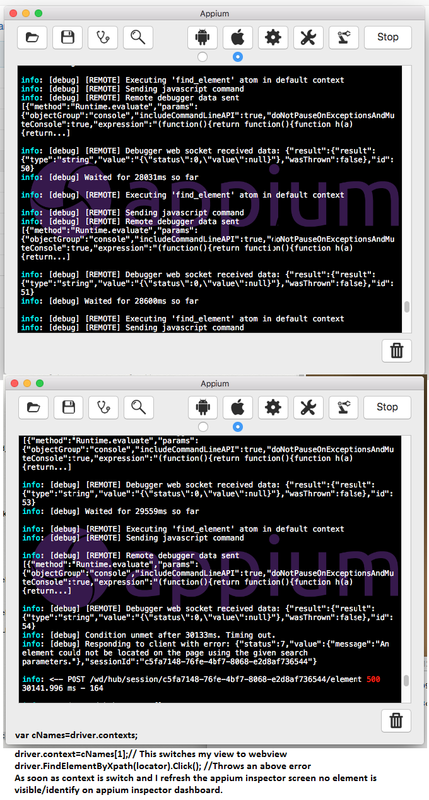 Doing IOS automation with xFramium tool+Appium+IOS. Could anyone help out from this issue.